Hannah Mayor was a founder member of both the Staithes Group and the Staithes Art Club, working alongside her husband, Fred Mayor, in Staithes. Hannah (nee Hoyland), fourth in a family of six girls and one boy, was born on 9th January 1871 in Dore, a village near Sheffield. Her father, Charles Hoyland, was a wealthy brush manufacturer in Sheffield. Hannah was educated at Sheffield High School where she consistently won top prizes for art. She went on to study in London at the Royal Female School of Art and at the Westminster School of Art, where she was again a star pupil. Queen Victoria made a visit to Westminster School and bought the flower picture on which Hannah was working at the time. During her twenties she continued to develop her artistic talents and her paintings were regularly accepted at major exhibitions. 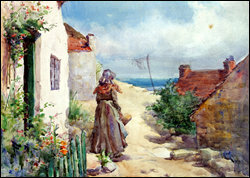 She returned to Yorkshire and soon joined the artist's colony in Staithes. 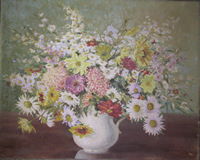 In these early days she painted landscapes, genre scenes and flower subjects in both oils and watercolours. She was a very popular member of the Staithes Group and a founder member of the Staithes Art Club with the two other female artists, Laura Knight and Isa Jobling. At Staithes she started working alongside Fred Mayor, also a founder member of both the Staithes Group and the Staithes Art Club. He was a family friend with whom she fell in love. Although much loved by Hannah's family, her father did not consider a penniless artist as a suitable husband for his daughter, and flatly refused his permission for them to marry. Shortly after her thirty-first birthday, Hannah and Fred decided to elope and were married at a church in London in 1902. Hannah's father was so furious that he "cut her off without a penny". Her first cousin, the actress Edith Wynne Mathison, who was at that time leading lady to Henry Irving, took pity on the penniless couple and lent them ten pounds. This enabled them to set sail for France, where they settled in Montreuil-sur-Mer, renting a fine house in the main square for £8 per year. In Montreuil, her first two children, Freddy and Charles were born. Shortly after Freddy's birth, one of her paintings was exhibited at the Royal Academy of Arts in April 1904. Charles was not to survive his twelfth birthday, but Freddy (1903-1973) later founded the Mayor Gallery in Cork Street, London. When their third child was on the way they moved back to England, renting a beautiful house in Whitchurch, Buckinghamshire, where in 1909, their daughter Edith was born. In 1912 they moved to Earl's Court Square, London and Hannah was subsequently hit by two terrible tragedies. In 1916, at the age of forty-nine, her husband, Fred, died as a result of a botched operation and in the following year her second son Charles, also died. Hannah continued to rent the big house in Earl's Court Square, letting out various parts of to enable her to continue to make ends meet. She kept for herself the beautiful, big studio drawing room where Fred had worked. Despite shortage of funds and much hardship, Hannah managed to provide Freddy and Edith with a private school education. She was also very generous in helping others, and her house was a refuge to young and old. During the period when Hannah was bringing up her children, she hardly painted at all. After the First World War she did start again with her creative work. 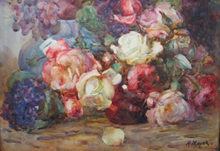 Her oil paintings of flowers were accepted at the Royal Academy and at various other exhibitions including the New English Arts Club, the Society of Women Artists, and the Royal Society of British Artists and the Royal Institute of Oil Painters. 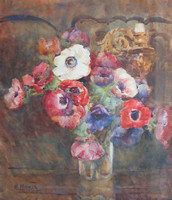 One of her landscapes, painted in watercolours is in the permanent collection at the Graves Art Gallery in Sheffield. She moved to a cottage in Brockham Green, Surrey in 1934 and continued to live in Surrey and exhibit her flower paintings and sold her painting of Autumn flowers at the Royal Academy of Arts in 1946. She died peacefully on 2nd November 1947 at Mynthurst, in Surrey, at the age of seventy-six. "Landscape with Cottages, Runswick Bay"
Hannah Mayor was a founder member of both the Staithes Group and the Staithes Art Club.